Go on a date with a soldier turned police officer? Me? And discuss Gandhi’s experiments with truth with a gun-toting Republican? The last thing Berkeley-dwelling peace activist Sophia Raday expected was to fall in love with a straightlaced Oakland police officer. As someone who had run away from cops dressed in riot gear at protests, Sophia was ambivalent, to say the least, at the prospect of dating Barrett, who was not only a cop but also a West Point graduate, an Airborne Ranger, and a major in the Army Reserve. During their courtship the two argued about many of the matters that divide the United States, things like drug policy and race relations. Startled by the freedom she found in a relationship of differences, by the challenge of sparring with Barrett, and by his steadfast acceptance of her, Sophia unwittingly fell in love. Then, just when Sophia believed her family was starting a new chapter with the birth of their son, came September 11. Barrett’s belief that he must always stay in Condition Yellow-the terminology coined by his favorite Guns & Ammo writer for a state of alert in which you realize your life is in danger and you may need to shoot someone-was suddenly in the forefront of their lives. Sophia and Barrett began to confront, on a very personal level, their differing viewpoints on polarizing values like fear, duty, family, and patriotism. When Barrett’s military duties escalated along with the country’s, Sophia found herself in the surprising position of military wife, living on an army base during the 2004 elections, and struggling to find peace with herself and her husband in this new world. It was a struggle that would continue up to the point of Barrett’s deployment to Iraq. 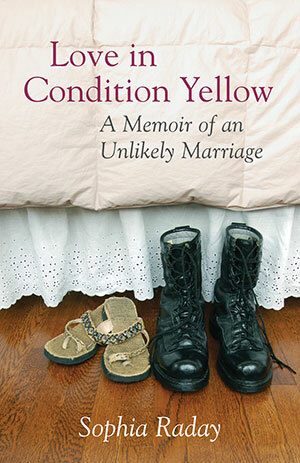 Love in Condition Yellow not only provides a vivid, poignant portrait of this unusual union, but also tells the larger story of how love doesn’t necessarily come from sameness, and peace doesn’t necessarily come from agreement. "Besides a clear understanding of who she is and what she wants, Raday has a solid sense of humor, an ear for dialogue and an eye for telling detail." I am instantly wary. Lowering my wineglass from my lips, I put one hand against the textured plaster wall to steady myself. I have prepared myself to talk about politics, about the Dayton Accords, Rabin’s assassination, or the budget impasse. But George’s question is going in an even more unpleasant direction, a direction that could lead into my love life in general. I want to avoid that at all costs. In fact, my mom had to cajole me into attending this party, assuring me no one would notice the redness around my nose and the way my eyelids are slightly swollen. I hear George saying I should just give Barrett a call. Really. Not for a date or anything, just for fun. But I know that’s just subterfuge. I know my cousin is doing a mental calculation of my age and wondering what’s wrong with Sopapilla, as he affectionately calls me. Where’s the boyfriend? Where’s the husband-to-be? My stomach muscles catch as George pulls a pen out of his shirt pocket and grabs a notepad from Molly’s bookshelf. I may no longer get arrested at the Nevada Test Site or at divestment protests. And it’s been years since I scaled Moffett Field’s barbed-wire fence with a friend to spray-paint “Work for Peace” across the “Be all you can be” recruitment billboard. But that doesn’t mean I have given up on social justice. Okay, I’m not married. But that doesn’t mean I’ll date just anybody. It doesn’t mean I’ve suddenly given up all my core beliefs! Just before our recent disastrous trip to Nepal, Nathan invited me to go see Thich Nhat Hanh at the Berkeley Community Theatre. We were both enchanted by the Vietnamese monk’s soft-spoken simple admonitions to find peace within and let it radiate out. Present moment, wonderful moment. When you are mindful, you see into the true nature of things, how a flower comes from soil, from decay. This is the sort of spirituality I expect to share with a partner. Maybe our getting back together will be the flower that blossoms from the garbage of our recent journey together. Keenly aware of approaching family members, I whisper to George that I appreciate the thought. Any normal person would get that subtle signal that I am not interested. Look, I appreciate the thought. But not George. “Tell you what,” he bellows, “here’s his number. I’ll tell him to call you, too.” Brandishing the slip of paper. Maybe if I just take the damn paper, George will stop broadcasting to the whole party that Sophia can’t find a man. “Barrett? Are you talking about Barrett? He’s cute!” Molly’s daughter Mallory exclaims. “I always liked the B-man too. He’s definitely got a special something,” Cousin Matthew adds. Despite my embarrassment, I realize this is an odd triangulation. Thirteen-year-old Mallory thinks Barrett’s cute and my thirty-oneyear- old gay cousin thinks he has je ne sais quoi. Hmm.